WOKING suffered their first league defeat in 18 months when they lost 65-7 away to Old Caterhamians last Saturday. 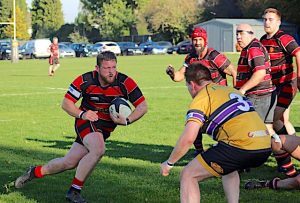 It was the first time the progressive Byfleet-based side had dropped points since 1 April 2017 when they lost 34-5 at home to Egham Hollowegians in Surrey 4. Despite making a positive start to life in Surrey 3, Woking’s trip to Surrey 3 was always going to be test of character due to the absence of a number of first team regulars through injury. The first half remained a relatively tight affair, with Woking ending the first half trailing 8-0, but having come close to drawing level on several occasions. The game ebbed and flowed in the second half until injuries to Gareth Nearn and Woking fly half Aitchison allowed the floodgates to open, which Old Cats duly took full advantage, crossing over the line at will. While the points-tally continued to rack up against them, Woking still demonstrated good spirit. They never allowed their heads to drop and were well worthy of their first and only converted try of the afternoon from Dickie.